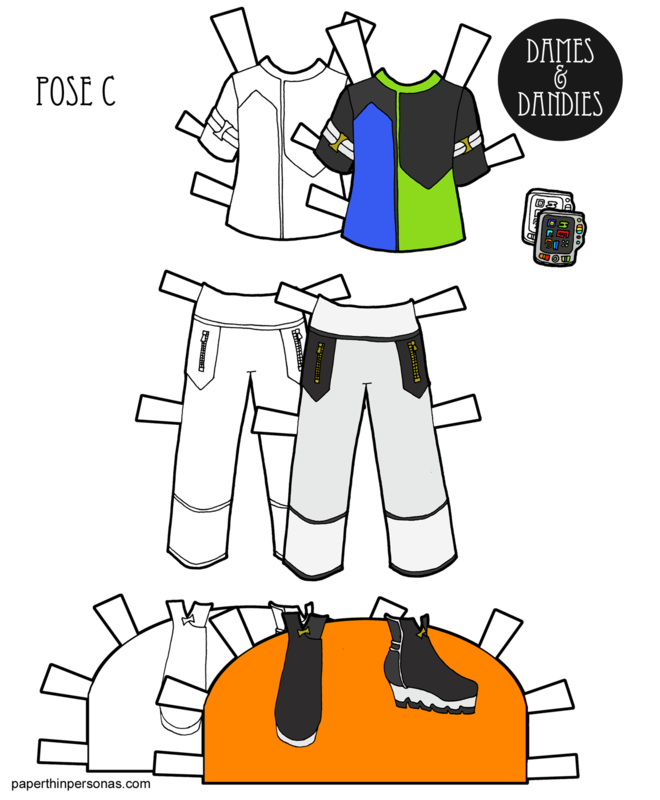 Printable Black & White PDF Printable Color PDF More Paper Dolls & ClothesCurrently, there are 18 diferent outfits for the C Pose guy paper dolls, but only one sci-fi outfit. So, here’s a second futuristic look. I confess openly that I’ve been watching a fair bit of absurd 1980s science fiction lately (Escape From New York is on Netflix, y’all) so I can pretend, at least, that the source of today’s paper doll outfit was those old movies. In actuality, when I sit down to draw I usually have a list of themes I want to try to work on and sometimes even thumbnail sketches. If today’s paper doll outfit came form anywhere I think it came from my awareness that I’d done contemporary paper doll clothing and fantasy paper dolls clothing, but not much sci-fi paper doll clothing. I haven’t done much sci-fi stuff for the ladies either, come to think of it. While I deeply admire people who can stick to one theme for a prolonged period, I know myself well enough to know that would never be me. I like too many things and I’m interested in too many things. I can’t imagine only drawing one type of thing. So, along with a super 1980s shirt, today’s paper doll has some fancy platform boots and a “hand computer” which- in good 1980s sci-fi fashion- is probably way clunkier than a cellphone or ipad would be today. It occasionally occurs to me that we are living in the future already and that’s fascinating. If you like the blog and want to keep it up and running than consider donating through Patreon. I’m also adding new things to the Etsy store at the moment, so go check that out if you haven’t. 12 MB of RAM, 500 MB hard drive, built in spread-sheet capabilities, and a modem that transmits at over 28,000 BPS! And it’s only the size of a cinder block! I would totally wear that shirt, in all its neon glory.